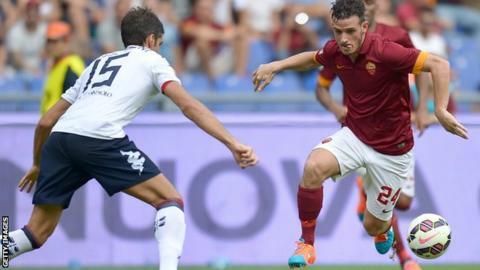 Alessandro Florenzi set up one goal and scored another as Roma went top of Serie A with a 2-0 win over Cagliari. Florenzi crossed for Mattia Destro's 10th-minute opener before scoring the second three minutes later after good work from Gervinho. Florenzi was booked for climbing into the stands to celebrate the goal with his 82-year-old grandmother. Ex-Chelsea defender Ashley Cole made his third start for Roma, who have not conceded in the league this season. Rudi Garcia's team were Serie A runners-up last term and have won all three of their league matches so far. Ashley Cole has made three Serie A starts for Roma and been on the winning side on each occasion. The 33-year-old has helped Rudi Garcia's team beat Fiorentina, Empoli and Cagliari without conceding a goal. Defending champions Juventus, who beat AC Milan 1-0 on Saturday, are the only other team with a 100% record. Former Arsenal forward Gervinho, who scored twice in Roma's 5-1 Champions League victory over CSKA Moscow on Wednesday, was at the heart of much of Roma's best play as they cruised to victory over Cagliari. Cagliari, who finished 15th last season, are still waiting for their first win of this campaign. Match ends, Roma 2, Cagliari 0. Second Half ends, Roma 2, Cagliari 0. Attempt saved. Samuele Longo (Cagliari) header from the centre of the box is saved in the centre of the goal. Corner, Cagliari. Conceded by Mapou Yanga-Mbiwa. Offside, Roma. Radja Nainggolan tries a through ball, but Urby Emanuelson is caught offside. Adem Ljajic (Roma) wins a free kick in the attacking half. Attempt blocked. Seydou Keita (Roma) left footed shot from the centre of the box is blocked. Assisted by Adem Ljajic. Attempt missed. Luca Ceppitelli (Cagliari) header from the centre of the box is close, but misses to the right. Assisted by João Pedro with a cross following a corner. Corner, Cagliari. Conceded by Maicon. Substitution, Roma. Urby Emanuelson replaces Daniele De Rossi because of an injury. Corner, Cagliari. Conceded by Morgan De Sanctis. Attempt saved. Samuele Longo (Cagliari) left footed shot from the right side of the box is saved in the top right corner. Assisted by Antonio Balzano. Attempt missed. Radja Nainggolan (Roma) right footed shot from outside the box is high and wide to the left. Assisted by Daniele De Rossi. Offside, Roma. Miralem Pjanic tries a through ball, but Gervinho is caught offside. Substitution, Roma. Adem Ljajic replaces Alessandro Florenzi. Attempt missed. João Pedro (Cagliari) left footed shot from outside the box is high and wide to the left. Substitution, Roma. Miralem Pjanic replaces Mattia Destro. Corner, Cagliari. Conceded by Seydou Keita. Attempt blocked. Samuele Longo (Cagliari) right footed shot from outside the box is blocked. Assisted by Daniele Dessena. Samuele Longo (Cagliari) wins a free kick on the left wing. Offside, Cagliari. Daniele Dessena tries a through ball, but Marco Sau is caught offside. Attempt missed. Maicon (Roma) right footed shot from outside the box is too high. Assisted by Daniele De Rossi. Luca Rossettini (Cagliari) is shown the yellow card for a bad foul. Mattia Destro (Roma) wins a free kick in the attacking half.